Holmes & Watson continues to cause a stir online with a few people thinking that the Mandela Effect is happening in real time. Some social media users have reported seeing two different opening scenes for the controversial comedy, and now confusion is starting to spread. The movie has received mixed reactions at best and there have been reports of moviegoers walking out of the theater before the movie ends. Additionally, the movie currently holds an 8% Fresh Rating on Rotten Tomatoes. A user on Reddit went to see Holmes & Watson and noticed that the opening scene was very differed from what he read in reviews online. 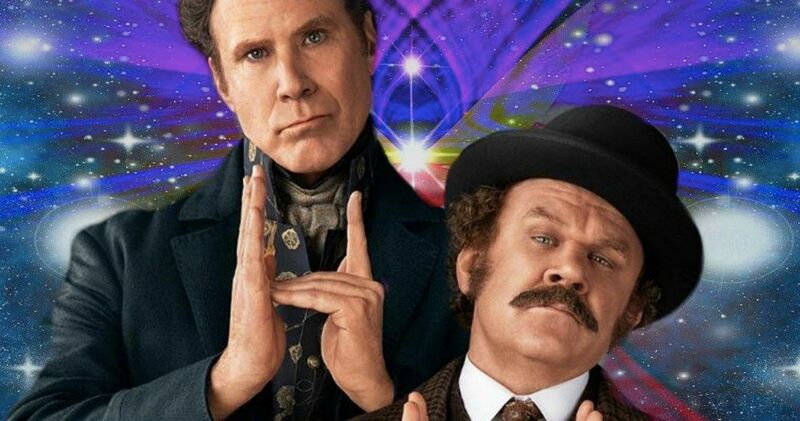 The opening that nearly everybody else has seen revolves around Holmes, played by Will Ferrell, being bullied as a child and comforted by Watson, played by John C. Reilly, which is when they become friends. However, the alternate universe version that this particular Reddit user saw started with something completely different. He explains. Many on Reddit initially just thought this was a troll, and that this was a fake post. But soon, other moviegoers from around the world were claiming that they also had witnessed this bizarre alternate opening scene that is not being shown in the states, as far as we’ve heard yet. On that note, no new viewers have really ventured back to the theater to check it out and chime in, either, as the comedy is being called one of the worst ever. Now, there are whispers that the infamous Mandela Effect is happening for Holmes & Watson. But that doesn’t necessarily appear to be the case here. Though, it could end up that way in the future. The Reddit user saw the movie in Australia, and since then, other moviegoers in New Zealand and Ireland have reported that they saw the same garden opening scene, too. It appears that there are two different regional cuts in existence that will more than likely end up on the Blu-ray edition of the movie. The Mandela Effect is the phenomenon of a massive group of people having a shared memory of something that no longer exists, or was never the way they remembered it, or never happened at all. Many people of a certain age truly believe Ed McMahon was the spokesman for Publishers Clearing House back in the 1980s and 1990s. Publisher’s Clearing House claims he never was, although millions of people remember him holding that big check. As it turns out, he actually worked for American Family Publishers (at least in this time stream that people believe has changed). People think Ed McMahon never working for Publisher’s Clearing House is the Mandela Effect in full force, altering history and our perceptions. Just like the thousands of people who seem to remember that Sinbad starred in a movie called Shazam, appearing as as a genie. Or that Curious George originally had a tail. Holmes & Watson is most likely not suffering from the Mandela Effect. This could just be a Redditor hired by Sony Studios to try and entice people back into theaters. But an alternate opening scene probably isn’t going to change the Rotten Score one bit. The allure of having two mysterious alternate openings is pretty enticing, though. It’s unclear why there are two different versions of the opening scene in different regions at this time, as Sony hasn’t made any official comment. While the comedy is being seriously frowned upon now, it could end up becoming a cult classic in the future. Then people will swear that they saw a different version of the opening scene in theaters. And that’s probably when The Mandela Effect will start to rear its ugly head once again. You can head over to Reddit to read more about the mysterious alternate opening scene in Holmes & Watson.